Pheast is a crowd-sourced recipe site. You can take any recipe on the site and easily tweak it to make it your own. For example, you can take the existing recipe on the site for Tomato Sauce, add your secret ingredient – say, oregano – and voila! You can now share your own version of this recipe. This makes it easier for people to share without typing out a whole recipe. Of course, recipes on the Internet are a crowded space – epicurious.com, foodnetwork.com, and allrecipes.com are a few of the more established sites. But none of these focus on sharing. They let you enter a recipe from scratch, but that is too cumbersome for most users to repeat regularly. Their sites are also extremely crowded and overloaded with too many features. 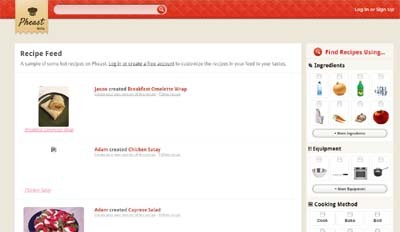 Pheast makes it easy to take an existing recipe, fork it, and share your own version.